Dinner doesn’t have to be stressful and time-consuming. That’s the whole philosophy behind Weeknight Society, a website and app created by Alexandra Hedin that plans wholesome, easy dinners for your family. Case in point: This 30-minute roasted Brussels sprouts quinoa. 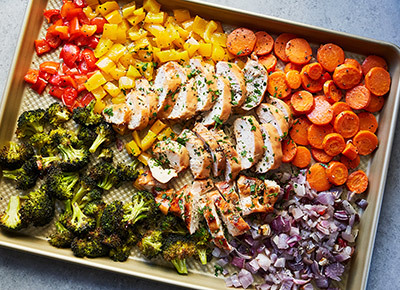 Just quickly roast some veggies on a sheet pan and microwave your quinoa (yep, it’s possible). 1. Preheat the oven to 450°F. On a baking sheet, toss the carrots, Brussels sprouts and red onion with the olive oil; season with salt and pepper. 2. Roast the vegetables until fork-tender, 15 to 20 minutes. 3. In a large microwave-safe bowl, combine the chicken stock, quinoa and thyme; season with salt and pepper. Cover the bowl tightly with plastic wrap and microwave it on high for 6 minutes. If there’s a lot of liquid remaining, microwave until it’s absorbed, about 3 more minutes. 4. Transfer the vegetables and any remaining olive oil from the baking sheet to the bowl and stir to combine; season with salt and pepper to taste.